Dans la partie historique de la ville, à une minute du Palais des Papes, à proximité de toutes commodités (sites d'intérêt, shopping, cinéma etc ...) bel appartement au deuxième étage d'un petit immeuble ancien de 4 étages. Calme, lumineux et parfait emplacement. L'appartement dispose d'un salon avec un canapé-lit pour une personne, d'une kitchenette-bar complète, d'une salle de bains avec douche et de toilettes privées, d'une chambre avec un lit queen-size. A 2 pas du monument principal de la ville "Palais des Papes"
The property was clean and comfortable with all the facilities we needed for our stay. The location was perfect and close to all facilities, we loved being in the centre of the old part of town. Francis could not have been more helpful. We stayed for two weeks this spring. The apartment was comfortable with everything we needed. Despite being located on a small quiet street, it's convenient to just about everything in the old city. Restaurants are a block or two away and you can walk to the main plaza and business street in just a few minutes. Francis was very helpful, providing advice about where to eat and what to see and calling us a taxi when we left. We especially appreciated his flexibility when one of us fell ill and faced the prospect of not being able to leave on the scheduled day. If we return to Avignon, this would be our first choice to stay. We spent 4 days at Francis's Apt. The apt was in a great location, and Francis was a perfect host. He oriented us to the apt and to the area and when we had questions he was very responsive. My wife and I highly recommend this apt. The Best Place to Stay when in Avingion! First of all, let me tell you about Francis. I saw that he was the rock star of VRbO. He had a taxi arranged to meet us right at our train coach to take us to the apt. He met us with a smile and a cheerful attitude. So welcomed after a long line issue at Charles de Gaulle airport. Avingion is an amazing city, and easy to navigate once you get acclimated. Francis tells you where to go, has directions and information for you, and will even call the taxi for you when it is time to leave. He makes certain you know how to reach him if you need him night or day. The Apartment is not large but so perfect for two people. It is well organized and spotlessly clean. The location cannot be beat. It is right next to the Pope’s Palace and gardens, as well as the supermarket. We will always make arrangements to stay at this apartment every time we come to Avingion. Thank you Francis for being such a wonderful host! Exellent, comfortable, well appointed property. My daughter and I had a wonderful 6 day stay here. It was well appointed with towels, hair drier,shampoo and shower gel, microwave etc. Francis was very welcoming and kindly met us at the TGV station (despite our train being 2 hours delayed!). There was a welcome bottle of water in the fridge on our arrival. He gave us some very useful advice on what to see and do in Avignon and surrounding area. 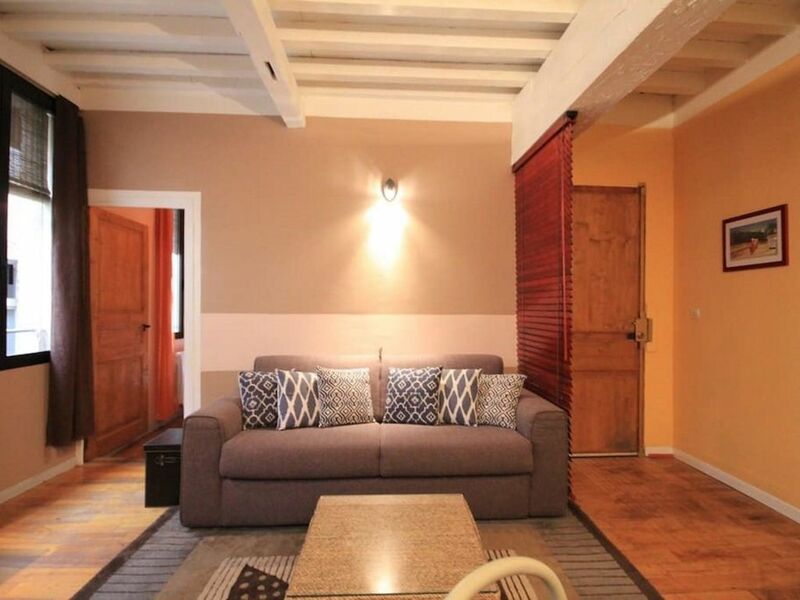 There is no air conditioning, but there are 2 fans in the lounge and one in the bedroom and the large windows open very wide.The property is in a really good location, only a few minutes walk to the Palais Des Papes and Le Place de l'Horlorge. It is generally very quiet, but the bin men come every morning at about 5am. However, we soon fell back to sleep after they went! We would thoroughly recommend this property. Apartment was awesome, wonderful location and Francis is an amazing host! Thank you Laura for your kind comments. It was a great pleasure to host you in my apartment.